The Halo 3 Announcement Trailer was debuted at E3 2006. Unlike the Halo: Combat Evolved and Halo 2 trailers, the Halo 3 trailer is in widescreen and HD (high-definition). Cortana's final line within the trailer seems to reference the first of the Cortana Letters. The Ark's Portal reflected on John-117's visor. Fade in from white to ruins at the edge of New Mombasa. A comical warning sign depicting a Grunt crossing swings in the wind. The camera slowly pulls back as a gust of wind kicks up a cloud of sand. A flash of blue light flows toward and past the camera, a partial image of Cortana visible. Cortana: (distorted) "...I have defied gods and demons..."
Cortana vanishes, and the camera continues to back through ruins. A cloud of smoke rises, along with the storm, distorting the familiar silhouette approaching the camera. Again, a transmission from Cortana flashes by, showing her lips moving realistically. Cortana: (distorted) "...I am your shield. I am your sword..."
The figure, which is clearly the Master Chief, walks through the smoke, an assault rifle over his shoulder. He stares off to the right. He readies the gun and looks straight ahead. A transmission flashes by showing Cortana's entire face. Cortana: "I know you. Your past, your future..."
Her face fades away into the Chief. Three Banshees fly toward the camera from behind him. We follow them to see a Covenant Assault Carrier in the foreground with a fairly sizable Covenant fleet in the background. Nine Banshees (whose pilots' identities are hidden from us) are escorting a Phantom. The Chief stands at the edge of a cliff. We follow the Covenant ships to see a massive Forerunner structure in the valley. A hole is in the center, directly beneath the eye of the storm within the raging clouds above. A shockwave sweeps the valley as plates in the structure rise. As soon as the shock wave occurs, the Assault Carriers start moving out of the huge crater. The cliffs start to break away, and the Chief watches his footing. Energy gathers in the center; we see the reflection in the Chief's visor. It fires; fade to white; cut to black. Cortana: (voice over) "This is the way the world ends." If you listen carefully, when Cortana speaks, a voice similar or identical to the Gravemind is saying the same words. This steadily becomes less and less obvious as the video goes on; by the time she says, "This is the way the world ends," the second voice is completely absent. The enormous hole in the swirling clouds above the middle of the structure in the crater is, according to Bungie, caused by strong, unseen forces from the structure itself. The terrain used in the trailer appears to have been used for the Main Menu of the final game, with the inclusion of the Forerunner Keyship. It is revealed in Halo 3 that the announcement is an early build of the final scene of the fourth level, The Storm. 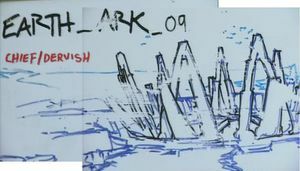 When the Announcement Trailer was first revealed, Halo 2's plot had implied that The Ark was located on Earth and this trailer was believed to be depicting its activation of the Halo Array, until the plot of Halo 3 revealed that it was actually the Portal, which would lead to the true Ark. The Halo 3 Announcement Trailer was named number 38 on Gametrailers list of the Top 100 Trailers of All Time in 2011. It was also voted number 5 on the user's choice list of the top trailers of all time.